You've already hit the jackpot for 4K gaming with the Xbox One X. Why not try for some more awesome loot? It feels like only yesterday that we learned of the true identity of a device code-named "Project Scorpio," and now we're weeks away from the launch of Microsoft's 4K gaming and video powerhouse, the Xbox One X. So to celebrate the upcoming release of the "world's most powerful console," we're giving away one (1) $1,000 gift card to the Microsoft Store plus another $1,000+ worth of prizes! 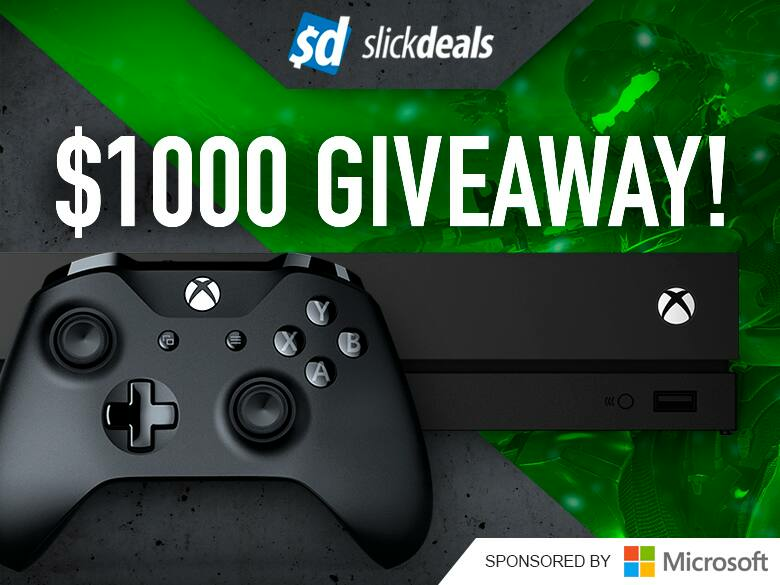 Special thanks to the Microsoft Store for sponsoring this giveaway with the largest prize pool we've ever seen on the Slickdeals blog! Remember when you used to draw treasure maps as a kid, complete with a challenging path and a big red "X"? Well, we're all grown up now, but we still love treasure hunts, and the "X" in this case belongs to the Xbox One X, with the treasure being the ability to play games in 4K resolution and 60 frames per second — a definite jackpot for serious graphics and gaming enthusiasts. Luckily, the pathway to 4K gaming is really straight-forward — just visit your local Microsoft Store or Microsoft.com to place a pre-order for the Xbox One X! And come November 7th, 2017, you'll be racing/shooting/sports-ing in glorious Ultra HD with HDR thanks to the processing power of the Xbox One X's Scorpio Engine. I'm sure you're already well-read on the Xbox One X's specs — 6 teraflops processor, 1TB storage, 12GB video memory, AMD Freesync technology, liquid cooling, and more — but what you'd really like to know more about is how to enter our $1,000 Xbox One X Giveaway. Well, that's easy. There are a few different ways to participate. Here at Slickdeals, we typically don't like to pay full price, but there are some things that are just too good to pass up or wait for a discount. So for all you day-one fanatics, this is a fun way to supplement your enthusiasm! Go to Microsoft.com via this link and pre-order the Xbox One X (which includes free shipping and returns). If you've already pre-ordered the Xbox One X from the Microsoft Store, go to the next step in this section. Fill out the form below and include the Microsoft Store order number from your Xbox One X pre-order. Note: Order numbers will be verified by the Microsoft Store to determine eligibility. Pre-orders from other retailers are not eligible. 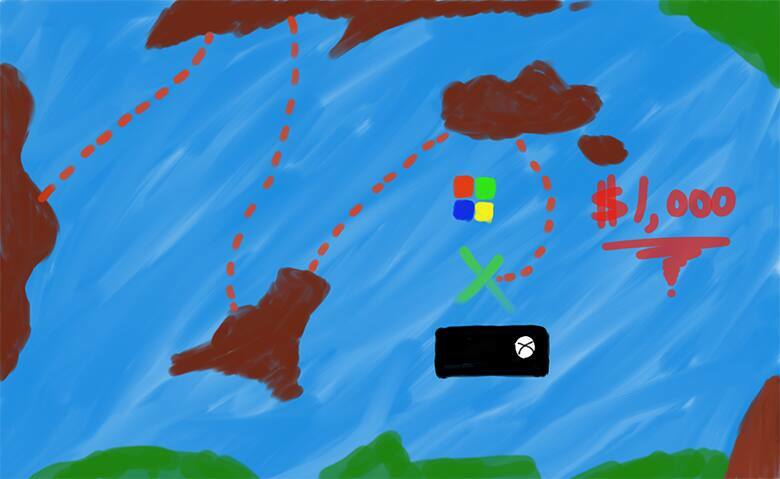 Create a treasure map leading to the Microsoft Store and/or Xbox One X using your favorite method/medium/art style, and share it on Twitter and/or Instagram (you can post to both places, if you want!). Include the hashtags #OneXmarksthespot, #Xboxpreorder, and #sweepstakes. Caption your image with "Follow me to a 4K gaming paradise!" All winners — 12 in total — will be announced on our weekly Facebook Live Talk Show at 2:30 pm PT on November 10th, 2017. Good luck, and happy treasure hunting! No purchase or payment of any kind is necessary to enter or win this promotion. A purchase or payment of any kind will not increase your chances of winning. Void where prohibited by law. Promotion only open to legal residents of the 50 U.S./D.C., 18 years and older. See full rules, terms, and conditions hosted in the Gleam widget above.